Home > Lighting > Candle Holders > Candelabra > Real Crystal Beaded Candelabra & Flower Tower "Alyx" - 4 Arm Gold - 34"
If you're trying to find that inspirational piece that sets the theme for your event, then start with this fabulous all-in-one Gold Candelabra "Alyx" and you'll be well on your way! 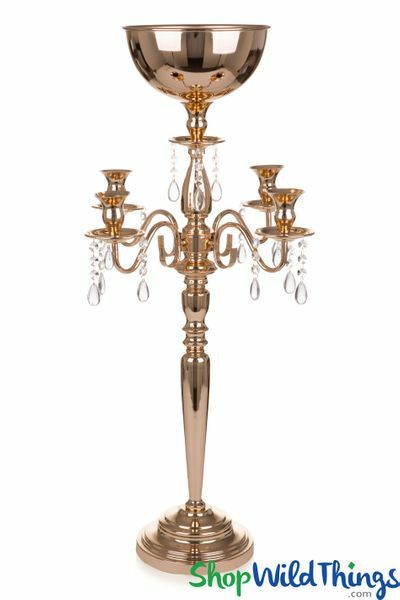 This new addition to our line of candelabras has everything you need to create stand-out centerpiece designs: the warm glow of candlelight, stunning crystal beads, a smooth shiny finish and it even has a place to hold floral arrangements! Alyx is 34" tall and there are 4 arms to hold taper candles. 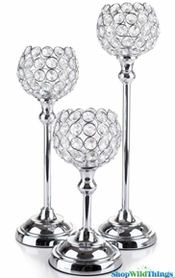 The cups have a gracefully curved trumpet-style design and the base of each cup is embellished with 4 1/2" long beaded crystal strands that have a gorgeous crystal clear teardrop pendant on the end. You will receive a total of 20 crystal strands, enclosed in bubble wrap. Another great feature is that Alyx is topped with a large gold bowl that's 8" wide by 4" deep! Perfect for holding floral arrangements! There are no drain holes so you could use Silk or Foam Flower Pomander Kissing Balls. Another option is to fill the bowl with water jelly pearls and use flameless LED waterproof candles to top it off. 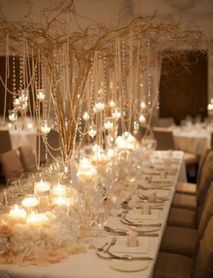 The water pearls are also great for keeping floral displays hydrated throughout your event. Arm to arm, Alyx is 18" wide, the base is 7 1/2" wide and it weighs almost 9 lbs. Candlelight and flowers all in one beautiful centerpiece - now that's inspirational!